Washington wants to “hold accountable those responsible for Venezuela’s tragic decline”. THE UNITED STATES has imposed sanctions on Venezuela’s state oil company PDVSA in the latest effort to ramp up pressure on the country’s embattled President Nicolas Maduro. 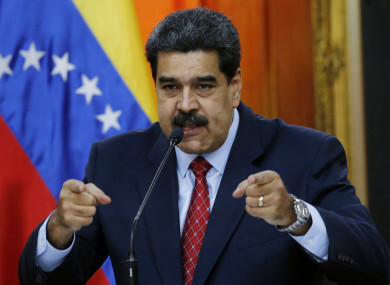 Treasury Secretary Steven Mnuchin said the sanctions prevented Maduro from diverting more resources from the crisis-damaged country until control in Caracas could be transferred to an interim government or new democratically elected government. However, Mnuchin said PDVSA’s US-based subsidiary Citgo would be able to continue operations, as long as its earnings were deposited into a blocked account in the United States. Washington “is holding accountable those responsible for Venezuela’s tragic decline”, Mnuchin announced at the White House. President Donald Trump last week immediately recognized Venezuela’s self-proclaimed president Juan Guaido, sparking a standoff with Maduro. Citgo “will be able to continue to operate provided that any funds that would otherwise go to the oil company instead will go into a blocked account in the United States”. The latest sanctions on PDVSA, which has been a “vehicle for corruption” will help prevent “further diverting of Venezuela’s assets by Maduro and preserve these assets for the people of Venezuela,” Mnuchin said. The United States will issue temporary licenses to ensure US, Caribbean and European refineries that rely on Venezuelan crude can keep buying PDVSA oil but he said many had been taking steps to find other sources. Email “US imposes sanctions on Venezuela's state oil company in bid to increase pressure on President Nicolas Maduro”. Feedback on “US imposes sanctions on Venezuela's state oil company in bid to increase pressure on President Nicolas Maduro”.